Have you met a Kangaroo? Skippy is not the only Kangaroo in the world, look at these 80 odd at the Bonorong Wildlife Sanctuary in Brighton, Tasmania. We got to go out with our grass pellets and gives these gorgeous creatures a pat. Friendly until you stop feeding and then expect a few paws going into your handbag and possibly a scratch or two. Naughty joeys! Australia’s national crest sports them as does our $1 coin and they are a true national treasure. Beware when driving on Australian roads as they do like to bounce around and will do more damage to your car sometimes then to themselves. When you see this yellow sign, keep an eye out. My hilarious gal pal JMac is in the Girls Night show at the Melbourne Fringe Festival. I’m there tomorrow night, come along and enjoy a laugh! I’m playing a gig tomorrow night at 8:45pm as part of the Melbourne Fringe Festival and I will def be wearing my HAWKS footy jumper! Go HAWKS! Come support comedy! Good times 🙂 Shout outs to the legendary Cath Styles for her hard work. Check out this great review here. My favourite time of year, Night Noodle Markets, Sydney. Luckily this year I’m going to be in Sydney to attend. The only trouble is trying to choose from the many many delicious dishes on offer. Night Noodle Markets – Crave Sydney Food Festival. The Crave Sydney International Food Festival presented by Citibank is managed by Fairfax Events. The famous inhabitants of this Island, The Tasmanian Devils. Named thus due to the ungoidly screatch and scream they make when fighting over food or habitats. First settlers said they islands were haunted with banshees, ghosts and devils. No not at all, just these fuzzy four legged friends. Sadly due to facial tumours, their population has diminished by 85% in the past 10 years. This is a tragedy and a huge threat to other Australian wildlife and the eco-system. Foxes are introduced pests and if not kept at bay, they will take over as predators and wreak havoc on our small mammals. This was an incredible evening wear God put on his most magical natural show for us. Visit www.hobartcity.com.au to learn more but otherwise, let the pics speak for themselves. Melbourne Fringe Festival Show coming soon – Darkness and Light. Starts on the 8th October. The line-up isn’t finalised yet, but it includes some fantastic comics, including Geraldine Hickey, Nath Valvo, Fiona Scott Norman, Toby Halligan, Ronny Chieng, Bart Freebairn, Matthew Klein, Tessa Waters, Simon Hall (Yon – Tripod), Joel Creasey and Charles Barrington, talking about some challenging times. There’s lots of emphasis on mental health issues, particularly depression. In it’s 3rd season at Melbourne Fringe, festival favourite Girls Night is a regular showcase of female comics that has also had successful seasons at Adelaide Fringe Festival, and Melbourne International Comedy Festivals over the past two years, as well as having a sold out mini tour of NSW and Queensland earlier this year. The aim of the show is to provide a regular showcase for female comics across all the comedy genres to promote their festival shows, and / themselves, whilst providing a great opportunity for networking amongst female comics. As well as providing these opportunities to established, and newer local female comics, Girls Night regularly features acts from the UK and US, as well as New Zealand, Canada, Scotland, and Germany to name a few countries, with the aim of helping visiting comics find an audience where they may not be well known. 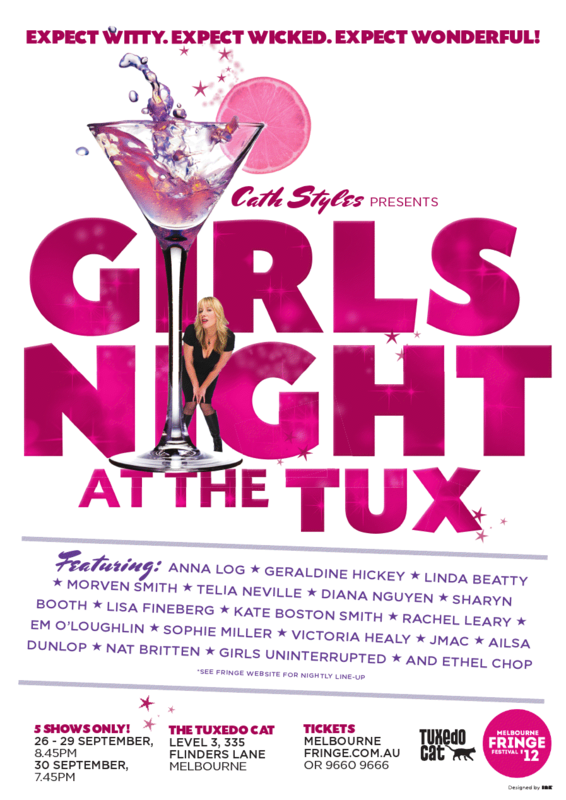 Girls Night has featured acts such as Fiona O’Laughlin, Felicity Ward, Cecelia Pacquola, and Bev Killick, and regular favourite DeAnne Smith, as well as up and coming acts such as Tegan Higginbotham and Girls Uninterrupted, and local favourites Geraldine Hickey and Ethel Chop. The line-up changes nightly, and includes, (but is not limited to) a mixture of stand-up and musical comedy, often also including clowning, circus acts, burlesque, and cabaret – all of which add up to a varied and value packed show. Had a fabulous time in Tassie as my Instagram followers can attest to. Here are some of my top updates via instagram during my time in Launceston and Hobart and surrounds of Tasmania. It’s hard to pick my favourite part of Tassie. Featuring International Headline performer: Wil Anderson, MC Bev Killick, Sean Choolburra, Greg Sullivan, Mark McConville & Fiona McGary. has been seen on all of the major commercial TV channels as well as being a featured comic on the Comedy Channels “Home Delivered Comedy’. Radio stations haven’t escaped his attention either, having been heard around the country under the “Home Grown Humour’ banner, but to be fully appreciated, he has to be seen live. He is the founder and director of Comedy Unlimited. A project that aims to use comedy as a strategy for improving mental health in all walks of life. – has performed as a standup comedian for Ten Years, both nationally and internationally, she has performed in every comedy venue in the country along side comedy legends such as Jim Oin, Adam Hills, Arj Barker, Judith Lucy, Will Anderson, Dave Hughes and many more. She has appeared on the ABC, Channel Seven’s Comedy Series FMVTV and The Comedy Channel’s Stand Up Australia. Also been heard on radio with Triple M Breakfast show, B105, Hot Fm Gold Coast and featured on the popular Home Grown Humour Series that was broadcast Australia wide on several networks. is one of Australia’s most colourful and entertaining identities. For seven years she coordinated and hosted the spectacularly successful Drag Race Meet at Bondi Beach for the Sydney Fringe Festival. She is proud dance mistress of her very own Crystal Stepz Dance Company, creating works of a kind rarely seen! She Co-hosted the Sydney Mardi Gras Parade telecasts on Channel Ten for 5 years.